Red drum are one of Florida’s most popular sport fish and the state’s most widespread estuarine fish. Floating a live shrimp under a popping cork is a good way to fish for Redfish. They also chase crabs, mullet, Pinfish and Killifish (mud minnows). Casting soft-bodied jigs, spoons and even top-water plugs will catch the attention of these powerful estuarine musicians. Redfish make great table fare. Habitat: In winter, Redfish are found in sea grass, over muddy or sand bottoms, or near oyster bars or spring fed creeks. 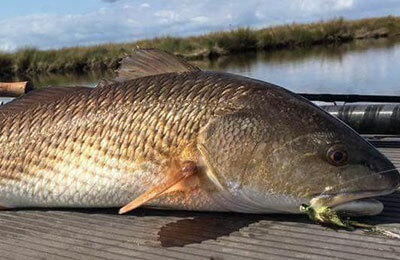 Behavior: Juvenile Redfish are an inshore species until they reach roughly 30 inches (4 years). They then migrate to the near shore population.